Service personnel and their families can experience difficulty in accessing commercial products and services due to their mobility and time spent outside the UK. 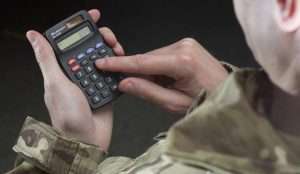 The Ministry of Defence (MOD) has worked with the financial sector to improve the ability of armed forces personnel to access financial products. The representative bodies for the financial sector are raising awareness within their membership of how to avoid disadvantage for service personnel and their families. They have worked with MOD to develop these top tips for the armed forces on credit ratings, mortgages and loans, BFPO addresses and insurance. Image: Serviceman using a calculator. Contains public sector information licensed under the Open Government Licence v3.0.